June 6th 2017 at Villa Lanna, the director of the Czech Academy of Sciences professor Eva Zažímalová awarded twenty-three young scientists with the Otto Wichterle Prize. Three of them – Ing. Vítězslav Jarý, Ph.D., RNDr. Lukáš Ondič, Ph.D., and Ing. Jakub Vícha, Ph.D. – are employed at the Institute of Physics (IoP) of the CAS. The Prize, named in honour of Prof. Otto Wichterle, the world renowned Czech chemist who also became the first post 1989 director of the Czech Academy of Sciences, is given to young scientists under the age of 35 for outstanding scientific achievement. Ing. Vítězslav Jarý, Ph.D., studied nuclear chemistry at the Department of Nuclear Chemistry, at the Czech Technical University in Prague. While studying towards his engineering degree he started working at the IoP under the supervision of doc. Ing. Martin Nikl, CSc in the department of Optical Materials. Vítězslav Jarý earned his Ph.D. in 2014 with his work on new materials suitable for detection of invisible ionising radiation (scintillating materials). At present he works on the development and research of new scintillating materials in the form of monocrystals, ceramics, and powders, which may be used both in science and industry. He focuses, in particular, on complete optical and scintillation characterisation, measurement of temperature stability of emission features and explanation of observed effects with phenomenological models. He also develops and researches new solid phosphors that are suitable for construction of tuneable sources of white light (circadian sources). Vítězslav Jarý performs complete optical characterisation of these materials, measures their temperature stability and studies their applications in realistic conditions. Vítězslav Jarý has worked at research facilities abroad, for instance, he spent five months at the Institut Lumière Matière in Lyon under the supervision of professor Dujardin. He is the author and the co-author of 65 articles in international impacted journals with a total of 548 citations, and holds four national patents. He has delivered a number of invited talks (USA, Japan, Thailand), and has participated in twelve international conferences (USA, Japan, China, ect.). RNDr. Lukáš Ondič, Ph.D., earned his joined Ph.D. at the Charles University in Prague (training at the IoP of CAS) and the University of Strasbourg. His 2014 thesis on „Silicon nanocrystals, photonic structures and optical gain,“ was awarded the Charles University Bolzano Prize for its innovation. 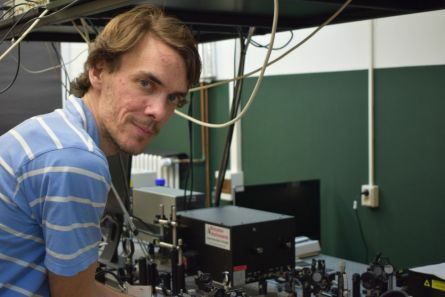 He continued to deepen his expertise and experimental knowledge as a postdoctoral researcher at the University of Bordeaux, where he participated in the construction of an optical experiment for nanoparticle trapping in vacuum (optical traps). The most important contribution of Lukáš Ondič so far is his study of optical properties of photonic crystals using the nanocrystal form of two important semiconductors: diamond and silicon. 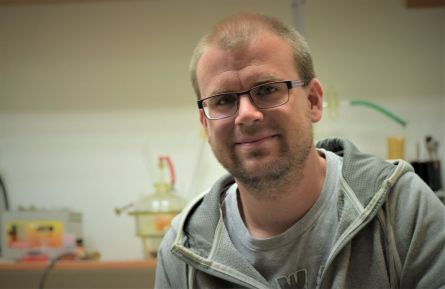 Lukáš Ondič initiated the preparation and characterisation of these periodic structures at the IoP and has since led research in this field there. In his research he combines both theory and experiment. His work comprises theoretical design of photonic structures, complete measurement of their optical properties, modelling, and interpretation of the results. He demonstrated, for instance, a substantially improved light extraction (photoluminescence) from nanodiamond containing light emitting defects and also from silicon nanocrystals by embedding them in photonic structures. The results were published in prestigious journals such as ACS Nano, Nanoscale and Scientific Reports, and one can expect their use not only in optoelectronic and quantum applications but also in biology in optical high sensitivity sensors. 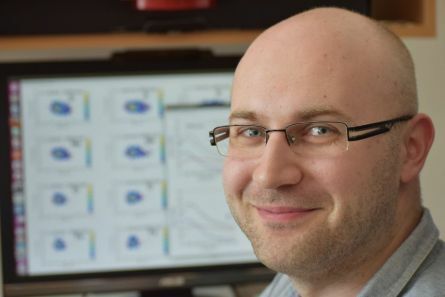 Lukáš Ondič presents his research at international conferences, and currently, he is the coordinator of a five-member team that includes two Ph.D. students. Ing. Jakub Vícha, Ph.D., works at the Department of Astroparticle Physics of the IoP of CAS. He currently studies primary ultra-high energy cosmic ray particles (up to 1020 eV) as a part of the Pierre Auger Observatory international collaboration. Knowing the radiation particle content is indispensable for the theoretical understanding of the origins of these particles, one of the biggest mysteries of contemporary physics. Jakub Vícha was the first in the world to use the relation between the composition of cosmic rays and the signal attenuation curve for various types of surface detectors and he developed a method that may be used to study degrees of mixing of different types of fundamental particles in the spectra of propagating cosmic ray nuclei. When studying longitudinal and transverse profiles of atmospheric showers Jakub Vícha is particularly interested in the precise determination of the cosmic ray composition in relation to the uncertainties of hadronic interaction model forecasts. He has also studied innovative cosmic ray detection methods with the help of RPC detectors and has visited other research facilities abroad in order to get further insight in this topic. Jakub Vícha is the author and co-author of more than 50 peer-reviewed articles in international journals. His research in cosmic rays, in particular, is followed with great interest by the international community of the Pierre Auger Observatory as well as by experts in the field at international conferences.